After falling off the bandwagon last year, I am once again presenting my annual Figaro awards for the best (and worst) operatic moments of the year. All operas seen at the San Francisco Opera in 2018, both the four operas of the Ring Cycle in the summer (Das Rheingold, Die Walküre, Siegfried, Götterdämmerung) and the five operas I attended in the fall (Cavalleria rusticana, Pagliacci, Roberto Devereux, Arabella, and Tosca) are eligible for these beauties. 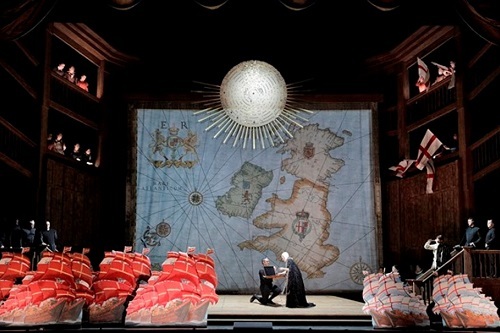 Production I would most readily see again: Roberto Devereux. I wasn’t quite sure what to expect from this opera as in the past I have been underwhelmed by the San Francisco Opera’s bel canto productions, however, they really came through on this one. Sonya Radvanovsky led a great ensemble cast and, while the bare-bones theater set didn’t always work for me, I thought the prologue was a creative solution to provide a basic understanding of the plot (I’m looking at you, Mary Queen of Scots). Best ensemble: The Ring Cycle. While I didn’t necessarily agree with all the production choices made by Francesca Zambello for this version, the singing across the board was so incredible that it made me forget I was listening to a fifteen-hour opera in German. I suppose it might be considered cheating to consider these four operas as one ensemble but I don’t care. Besides, I already listed Roberto Devereux above. Most disappointing production: Tosca. This “new” production had a lot to live up to considering the previous one was my favorite opera of the 2012 fall season. 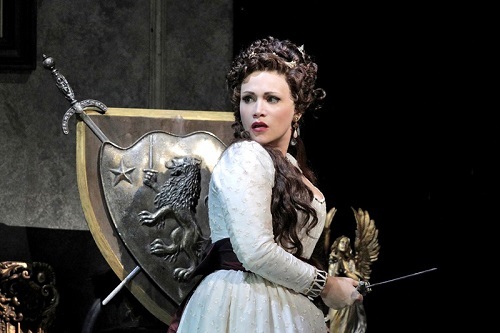 Unfortunately, despite a great performance by Carmen Giannattasio as Tosca, I am at a loss as to why San Francisco Opera felt the need to stage this warhorse again so soon after replaying it in the 2014 season, especially when the overall set design didn’t seem very different from the previous one. Best production/set design: Benoît Dugardyn for Roberto Devereux. Not everything Dugardyn created for Devereux worked for me, but I admire the chances he took and the creativity he displayed with this vision. Best costumes: Tobias Hoheisel for Arabella. While I thought there could have been a bit more color overall, the costumes underscored the understated elegance of this production. Outstanding performance (orchestral): Donald Runnicles leading The Ring Cycle. I almost always like when Runnicles conducts (see also Les Troyens), but he was masterful with his pacing of this behemoth. Outstanding performance (male lead): Marco Berti as Canio in Pagliacci. Berti won over all my doubts with his delivery of “Vesta la giubba” when it counted. Plus his acting was first rate throughout—despite his heavy makeup and mask, I really felt his anger. Outstanding performance (female lead): Sondra Radvanovsky as Elisabeth in Roberto Devereux. Both singing and acting came together for this incredible performance. Outstanding aria (male): Russell Thomas’s “Come uno spirito angelico” in Roberto Devereux. Although somewhat overshadowed by Radvanovsky, Thomas delivered the goods from behind the bars of the Tower of London. Outstanding aria (female): Carmen Giannattasio’s “Vissi d’arte” in Tosca. As mentioned above, I was rather disappointed by this production as a whole, but Giannattasio was not the reason. Outstanding performance in a supporting role (male): Štefan Margita as Loge in Das Rheingold. A small role but beautifully sung; Margita made me sit up and take notice. Outstanding performance in a supporting role (female): Jamie Barton as Fricka in Die Walkure. I liked Barton in Roberto Devereux, but her work in The Ring Cycle could have easily been overshadowed and it wasn’t. 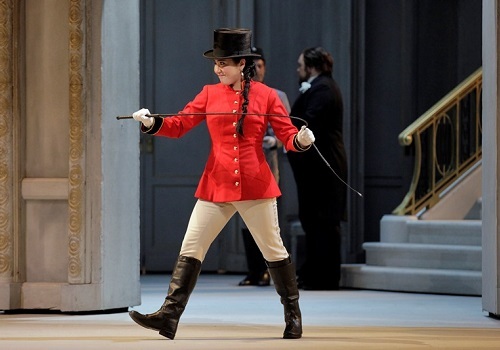 Outstanding performance (female playing a woman playing a man): Heidi Stober as Zdenka/Zdenko in Arabella. I always love Stober and she was a highlight in this otherwise fairly uninteresting opera. 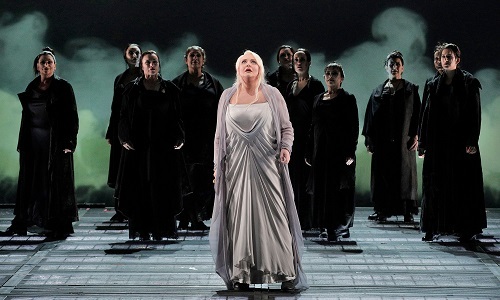 Outstanding performance (pinch hitter): Iréne Theorin as Brünnhilde in The Ring Cycle. A lot of the weight of The Ring Cycle is on Brünnhilde’s shoulders and Theorin (last seen as the icy Turandot in Turandot and who was announced as the replacement for Evelyn Herlitzius just a month before performances started) carried the role off with ease and had fantastic chemistry with her costar Daniel Brenna to boot. Outstanding performance (couples skate): Lianna Haroutounian as Nedda and David Pershall as Silvio in Pagliacci. These crazy kids sang the sweetest love duet of the season. Outstanding performance (Adler Fellow): Amitai Pati as Lord Cecil in Roberto Devereux. I didn’t seem to notice the Adler Fellows as much as in years past, but Pati stood out in this small role. 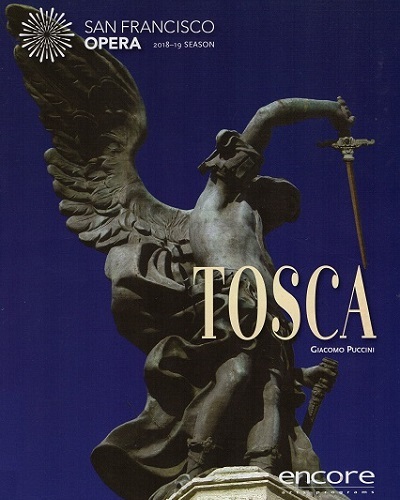 Favorite program cover: Tosca. Though I was somewhat tempted by the portrait of Elizabeth I on the cover of Roberto Devereux, ultimately I went with the photograph of the statue of the Archangel Michael on the Castel Sant’Angelo in Rome, which plays such a critical role in the finale of Tosca. Gigli award for worst chemistry: Ellie Dehn as Arabella and Brian Mulligan as Mandryka in Arabella. I’ve enjoyed both leads in the past, and they sang well here, but unfortunately the couple remained fairly stiff throughout their performance and ultimately just weren’t very convincing as the lovers in this semi-comic opera. Finally, a shout out to the tweeps who know far more than me about all things opera and make all of these performances that much more interesting, whether in person or online: @Aspasia_1, @ilana_wb, @JamesJetsOften, @operatattler, @phibetakitten, @revgirrl. And so the clock runs down on another year and another round of Figaros. I look forward to attending Orlando and Rusalka during the summer season and seeing what the 2019-2020 season will bring. Feel free to comment or argue for your favorite (and not-so-favorite) moments of the season below. 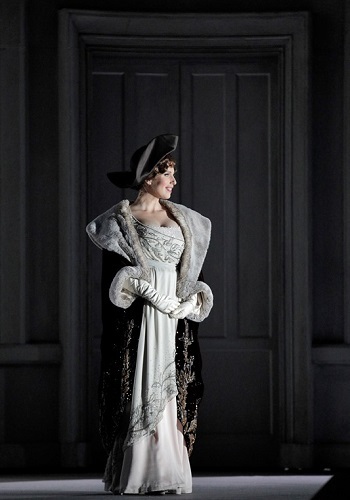 *Note: All photos in this post except the Tosca cover were taken by Cory Weaver for San Francisco Opera. Overture as history lesson in Roberto Devereux. Photo by Cory Weaver. Plot in 101 words or less: On this week’s episode of The Crown, Sara is sad—really sad—and Elizabeth is mad—really mad. Lord Cecil and his gang of (literal) peers are mad too. They’re plotting against the queen’s favorite, Devereux, who’s been playing footsie with those pesky Irish rebels. Devereux returns to plead his case but admits to Elizabeth he loves another and leaves her ring—the one that would guarantee his safety—with Sara, his best friend’s girl and object of his affections. Sara can’t get the ring back to him and so… off with his head! Should have found some hobbits. Or eagles. 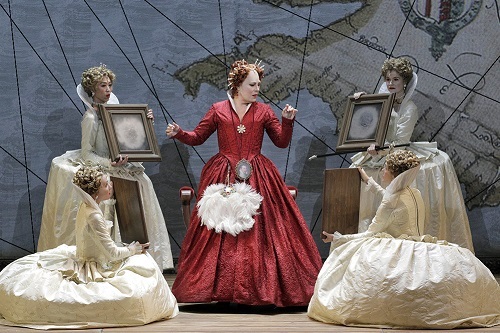 Mirror, mirror, on the wall… Sondra Radvanovsky as Elisabetta in Roberto Devereux. Photo by Cory Weaver. 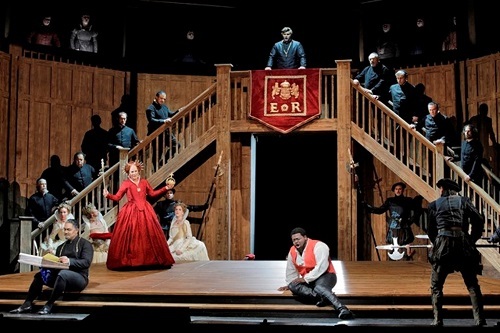 As a self-proclaimed bel canto whore and lover of all things Tudor, I was bound to like Roberto Devereux, one of Gaetano Donizetti’s three “queen” operas, which, along with Anna Bolena and Maria Stuarda, forms what is known as the Tudor Trilogy. But I liked it even more than I thought. Of course, this is not really surprising as Devereux had another strong point in its favor with the teaming of soprano Sondra Radvanovsky as Elisabetta and mezzo-soprano Jamie Barton as Sara, the Duchess of Nottingham, who we last saw together on the War Memorial stage in Norma and on whom I rightly bestowed multiple Figaros for outstanding performance. 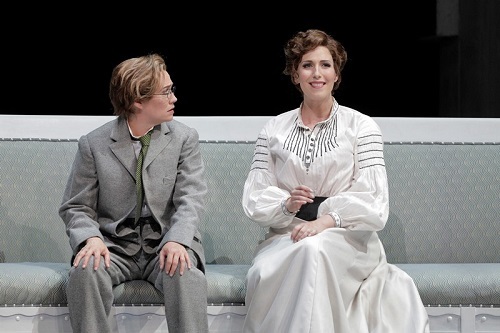 Sondra Radvanovsky as Elisabetta (left) and Jamie Barton as Sara (right). Photo by Cory Weaver. Radvanovsky was fantastic here, both in voice and in her acting. The woman next to me seemed absolutely convinced she was elderly. For my part, I was amazed by her ability to convey imperial majesty and temperament as well as a certain kind of frailty and vulnerability. Jamie Barton’s Sara was a lovely counterpoint to this fierce and fearless portrayal, singing with what seemed a heartfelt and melancholic resolve. 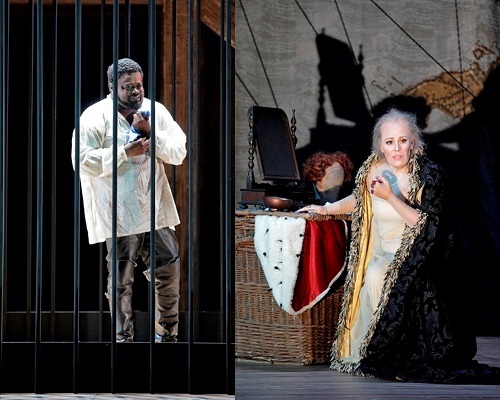 Tenor Russell Thomas as the eponymous Devereux also sang beautifully, especially in his final moments behind bars in the Tower with “Come uno spirito angelico.” Adler Fellow Amitai Pati once again stood out in a small role, that of the devious Lord Cecil. What’s a little swordplay between friends? 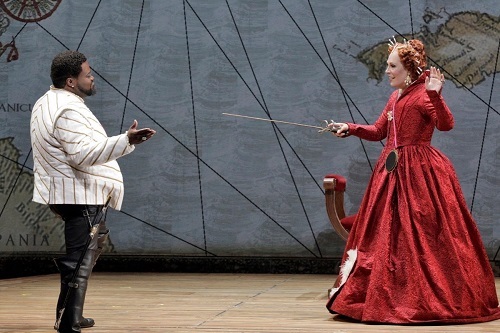 Russell Thomas as Roberto Devereux (left) and Sondra Radvanovsky (right). Photo by Cory Weaver. This production conducts an elaborate history lesson in the prologue, which I liked, but wasn’t really necessary. It might have been more helpful to the audience to have highlighted more specific emotional or political aspects of Elizabeth’s reign. That said, I’m always happy to see sailing ships. Still, this emphasis on “history” seemed at odds with the set itself, which was designed by Benoit Dugardyn and based on Shakespeare’s Globe Theater—a choice that emphasized the performance nature of an opera that is not quite based on actual history. While this bare set mostly worked, it did lead to a few clunky staging efforts, such as the final execution and renunciation of the throne. Oddly enough, I liked the whole glass casing idea that opened and closed the opera. The costumes by Ingeborg Bernerth were similarly uneven. I loved some of the elaborate dresses, but Sara seemed rather plain in comparison considering she was Duchess of Nottingham. You play with swords, you get the axe. Photo by Cory Weaver. I realize this brief summary makes it seem like I didn’t like the production design, which is not the case, I just feel like it could have been more cohesive and less didactic somehow. Regardless, the singing was absolutely stellar. In short, more Tudor queens, please! Even Shakespeare shows up! Photo by Cory Weaver. 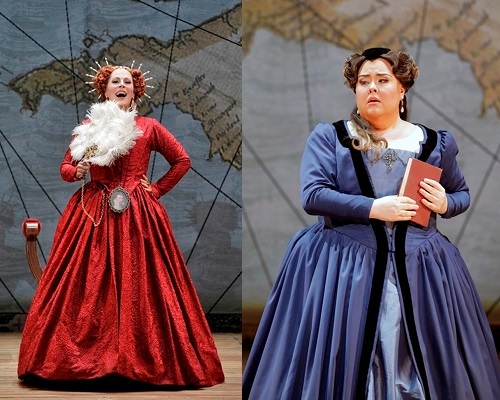 There are only two more performances of Roberto Devereux at the War Memorial Opera House, on September 23 and September 27. Run, don’t walk, to see this incredible production! A performer entertains the crowd in Pagliacci. Photo by Cory Weaver. 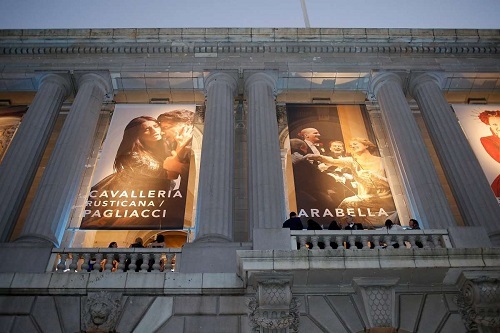 Cavalleria rusticana and Pagliacci are two short verismo operas that often appear together on a double bill, as San Francisco Opera has chosen to do for their 2018–2019 season, with a production originally from the Opéra Royal de Wallonie-Liège. The entire production is about three hours, including one intermission between the two operas. Verismo is an Italian operatic style that emerged in the late 1800s and can be considered a realist (or naturalist) style, with plots taking their inspiration from real life. In other words, verismo presents everyday people with everyday problems, albeit at the usual operatic extreme. [Side note: The other major non-Puccini verismo opera is Andrea Chénier, which opened the 2016–2017 SFO season.] I can’t say I’m a huge fan, despite naturalist author Émile Zola being a favorite of mine. However, this was my first “Cav/Pag” as the kids say, so maybe I shouldn’t be too quick to judge. In both Cavalleria rusticana and Pagliacci, the plot is fairly straightforward: a married woman is having an affair and her jealous husband kills her lover. But only one has clowns. Plot in 101 words or less: Villager Santuzza is pregnant by ex-soldier Turiddu, son of innkeeper Mamma Lucia. Before getting his gun on, Turiddu was with Lola, but when the cat’s away the mouse will marry someone else, namely Alfio. Because getting with Santuzza made Lola jealous (as planned), she and Turiddu start up again. Santuzza gets pushed around literally and figuratively, curses Turiddu, and tells Alfio what’s what. And… intermezzo. Everyone, drink! Well, everyone except Alfio, who refuses Turiddu’s wine and challenges him to a duel. Turiddu Mike Tysons Alfio’s ear—apparently it’s a Sicilian thing, not one of the “Ten Duel Commandments.” Justice is served. 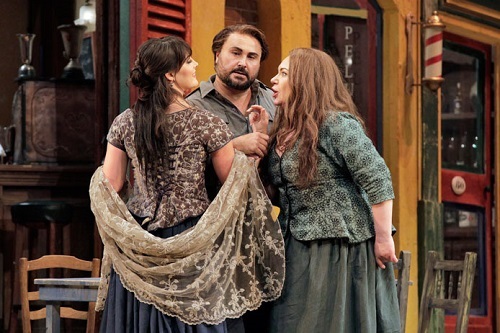 Laura Krumm as Lola, Roberto Aronica as Turiddu, and Ekaterina Semenchuk as Santuzza in Cavalleria Rusticana. Photo by Cory Weaver. Plot in 101 words or less: Traveling performers, including Canio—clowno numero uno—and his wife Nedda, come to town for a Ferragosto performance. Soon Nedda is by herself, singing Jenny Gump’s prayer. Tonio—clowno numero duo—tries to seduce Nedda, to no avail, mostly because she likes villager Silvio, who’s no fool. Unfortunately, Canio learns of their affair before they can run away together. The performance begins. Mise en abîme alert! The audience realizes too late that the jealous obsession playing out on stage is a little too real: Canio stabs Nedda, and then Silvio. In short, you are well advised to be scared of clowns. 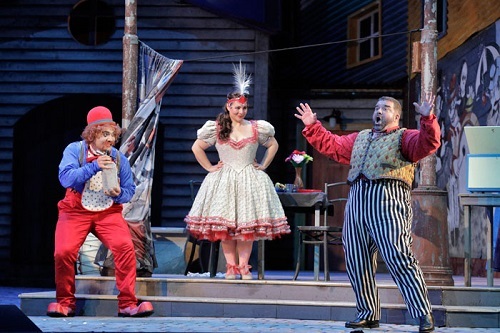 Amitai Pati as Beppe, Lianna Haroutounian as Nedda, and Dimitri Platanias as Tonio in Pagliacci. Photo by Cory Weaver. 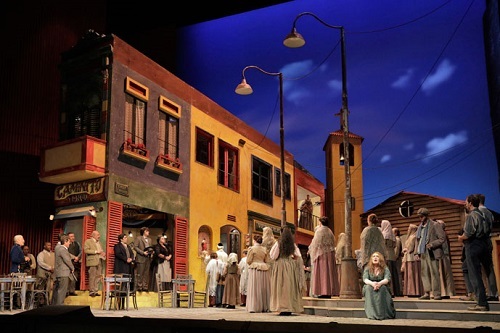 While both of these operas as written take place in southern Italy, this production by Argentine José Cura sets both operas in La Boca, the Italian quarter of Buenos Aires. This mostly worked for me, although, if you didn’t read the production notes, I can see why you might be confused at times since the characters in this production overlap. 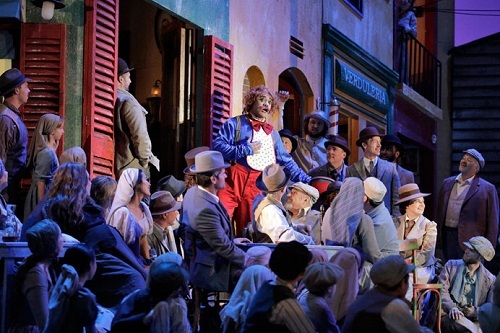 For example, Pagliacci opens with Turridu’s coffin, Santuzza appears noticeably more pregnant in Pagliacci, and the character of Silvio now works in Mamma Lucia’s bar from Cavalleria. 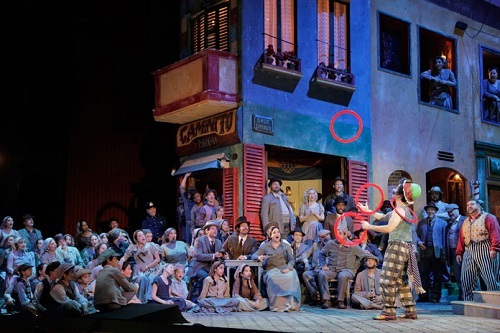 In fact, it is Mamma Lucia who utters the famous closing of Pagliacci—“La commedia è finita”—which I found a distinctly odd choice, whatever the rationale. Ekaterina Semenchuk as Santuzza (seated) in a scene from Cavalleria Rusticana. Photo by Cory Weaver. As this was my first Cav/Pag, I went in fairly open to both operas. From what I had read, Cavalleria seemed to be considered the more “musical” of the two, but I came out highly predisposed to Pagliacci. The construction is far more creative, including the complex “play within a play” and the breaking of the fourth wall with the prologue, but it is also stronger from an emotional perspective and had more “breakout” arias to these ears. As for the singing, it seemed a bit uneven. While I really loved the tone of most of the singers, at times they felt underpowered. This was mostly on the male side, as the women came off fairly well. The highlight for me was soprano Lianna Haroutounian as Nedda in Pagliacci. Mezzo-soprano Ekaterina Semenchuk as Santuzza in Cavalleria was also impressive, although I don’t think she had much to work with. Her acting certainly stood out: Given that the role is not particularly sympathetic, I felt for her. (If you remember, Semenchuk was also a highlight for me in Luisa Miller. I was even impressed by some of the smaller parts, such as Laura Krumm’s Lola, which is rare for me. For the men, one obvious highlight was tenor Marco Berti’s delivery of Canio’s “Vesta la giubba” (I was rather relieved when he delivered on that since I felt he cut short the final note of “Nessun dorma” when I last saw him in Turandot). Berti was also one of the better actors: Despite his heavy makeup and mask, I really felt his anger. 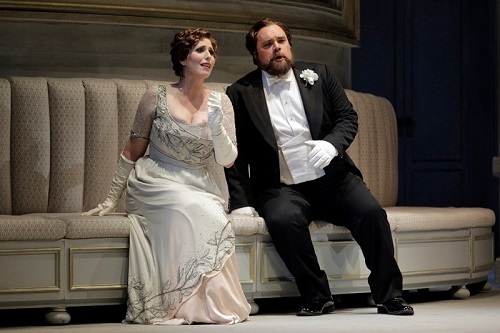 I also liked Merola graduate David Pershall as Nedda’s lover Silvio. He has been in a few things I’ve seen but I’ve never made note of him before. His love duet Haroutounian was very nice. I thought Adler Fellow Amitai Pati had excellent tone as Beppe and stood out in his aria even if it was a bit soft. 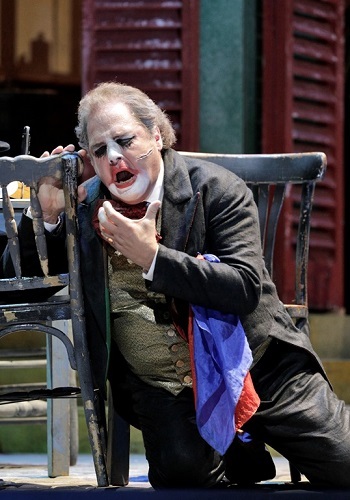 Dimitri Platanias, the sole singer to truly have a dual role and making his SFO debut, as Alfio in Cavalleria and Tonio in Pagliacci seemed to do a little better with Pagliacci, especially in the prologue. Amitai Pati as Beppe as Arlecchino in Pagliacci. Photo by Cory Weaver. A distinct disappointment for me was the dance interlude. Given the resetting, I was hoping for a fiery Argentine tango with its classic snap kicking and I felt the choreography did not live up to its potential. What did live up to their potential were my fellow operagoers, whose outfits (mostly) rose to the occasion. 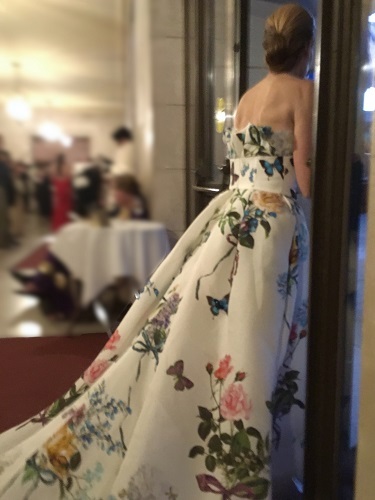 Unfortunately, the San Francisco Chronicle’s coverage was fairly weak this year, so I’ve only included my own pictures below; however, I wasn’t able to capture all my favorite looks. For example, Komal Shah wore a beautiful Dolce & Gabbana floral number and Camille Bently donned a black, jeweled Christian Siriano gown, both of which were well suited for the “¡Viva La Noche!” theme. There are six more performances of Cavalleria rusticana and Pagliacci at the War Memorial Opera House on September 12, 16 (2 pm), 19, 22, 28 and 30 (2 pm). In the third act of our series on concise opera plots, it’s all German all the time. Specifically Wagner, or, as I like to think of him, Vague-ner. Not that he’s vague so much as his plots seem to wander all over the place, much like a hobbit on his way to Mount Doom. As in my posts on the warhorses, I’ll be sticking to 101 words or less** per opera. It almost makes me wish I spoke German, since then I could use really long words. 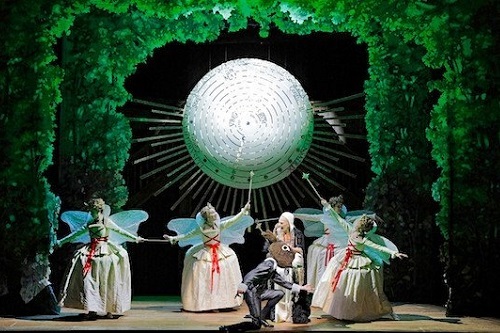 I’ve included the three other Wagner operas I’ve seen live (Der Fliegende Holländer, Lohengrin, and Die Meistersinger von Nürnberg) in this post, but it focuses on the oft-quoted Der Ring des Nibelungen, a series of four “music-dramas” that tell the story of a little person who forges a magic gold ring of power that everybody covets. Also, there’s a sword that needs to be pieced back together. Sound familiar? Both rings were round, and there the resemblance ceases. —Sure, Tolkien, whatever you say. SPOILER ALERT: There are no puppies or unicorns, but there is a rainbow. Who says Germans aren’t lighthearted? Storms + sleepy watchman = stealth ghost ship. Math is fun! Enter the Dutchman, cursed to roam the seas until he finds someone faithful unto death. Since Captain Daland values gold more than his daughter, he invites the stranger home. Cue Senta, who’s hanging with her friends, spinning and singing, as girls do. The stranger looks exactly like Senta’s Tiger Beat Dutchman portrait, so she’s all in. Unfortunately, ex Erik strives to remain relevant and his whining drives the Dutchman away. Senta throws herself into the sea, thereby lifting the curse. Like dogs, they all go to heaven, so it’s cool. Swan, swan, hummingbird, swan. Actually, scratch that, there’s no hummingbird. There’s also no baby duke Gottfried! Count Friedrich accuses Elsa, Gottfried’s sister, of foul play so he can rule instead. Visiting King Henry decrees God will judge through single combat. A knight appears (via swan boat) to fight for and marry Elsa; however, she can’t ask his name or birthplace. She eventually does. Nosy parker. So, Lohengrin, knight of the Holy Grail and protector extraordinaire, must leave. And… swan. OMG, baby Gottfried is a f*cking swan, y’all. Ortrud’s a witch and cursed him ages ago. Elsa, stricken with grief, falls dead. Knight Walther, in town on business, spots Eva and falls hard. Alas! Eva is to marry whoever wins the local song contest. David, who crushes on Eva’s companion Magdalene, explains the rules of mastersinging (it’s a thing, okay?). Walther can do this, no problem (he can’t). Burgermeister Meisterburger Beckmesser, who also wants to marry Eva, fumes. He serenades a disguised Magdalene by accident, much to the dismay of David. Fight! Fight! Walther (literally) dreams up the perfect song and cobbler Sachs stirs the pot by ensuring Beckmesser plays the fool. For some reason, this takes almost six hours to play out. 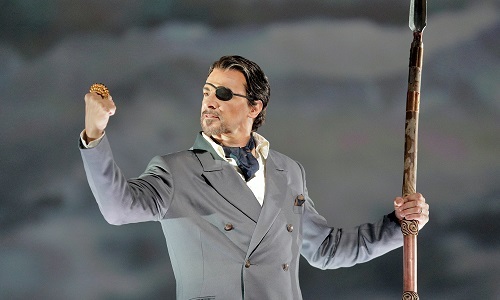 Greer Grimsley as Wotan in San Francisco Opera’s Der Ring des Nibelungen. Photo by Cory Weaver. The “Ring” cycle consists of four operas intended to be performed together in sequence: Das Rheingold (The Rhine Gold), Die Walküre (The Valkyrie), Siegfried, and Götterdämmerung (Twilight of the Gods, or, as I like to say, Goddamn It’s Long). They tell the story of the theft of the Rhine gold and the forging of it into a magic ring of power and the tragedies that befall those who possess it. The four operas total about fifteen hours (without intermission) and follow multiple generations of mortal men and gods. Balance is only restored when the ring is destroyed by fire. Think The Lord of the Rings, but with more women. 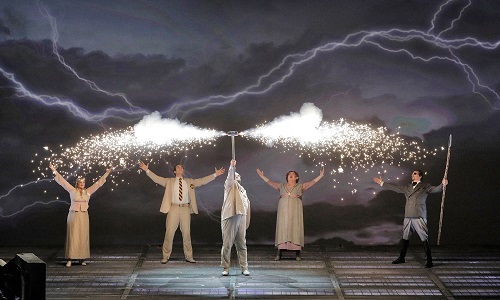 The Rhinemaidens and Alberich in Das Rheingold. Photo by Cory Weaver. Pretty but dumb Rhinemaidens let dwarf Alberich steal the Rhine gold and forge a magic ring of “boundless might.” Meanwhile, Wotan and Fricka build a shiny new castle but won’t pay contractors Fasolt and Fafner, so the giant brothers take Fricka’s sister Freia hostage. When the gods realize they can’t live without Freia’s Fountain of Youth™ apples, Wotan and sidekick Loge trick Alberich and steal his ring as ransom. Alberich curses his “precious” to bring woe to all who possess it. Gold, gold, gold. Bicker, bicker, bicker. Fafner clubs Fasolt to death. Everybody else scampers over the rainbow bridge to Valhalla. Tough love from Wotan in Die Walküre. Photo by Cory Weaver. Siegmund is on the run. He shelters with unhappy wife Sieglinde and husband Hunding, recounting his tale of woe. (Mother dead! Sister abducted!) Siegmund and Sieglinde have the hots for each other, but, gross, they’re twins. Remember cheapskate Wotan from Rheingold? He’s their father! 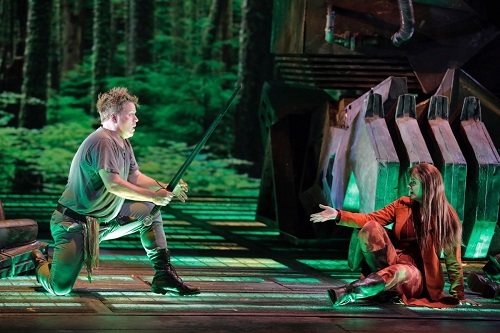 Wotan instructs favorite Valkyrie daughter Brünnhilde to protect Siegmund, but Fricka wants to punish the couple. Brünnhilde tries to save Siegmund but only manages a pregnant Sieglinde and a shattered sword. Wotan leaves Brünnhilde sleeping on a rock surrounded by a ring of fire. As you do. The Valkyries are all sound and fury, signifying nothing. Cowards. Nine Valkyries? Hey, aren’t there nine Nazgûl? I thought so. 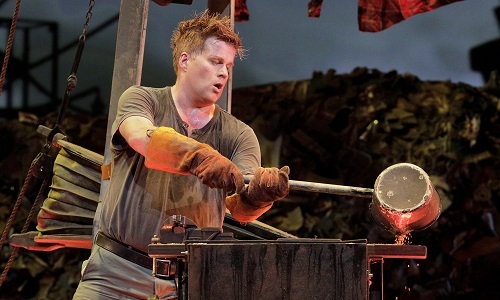 “Renewed shall be blade that was broken…” by Daniel Brenna as the eponymous Siegfried. Photo by Cory Weaver. We open on Mime, brother of ringmaker-heartbreaker Alberich, who has, in a not-at-all-suspicious twist, adopted the fearless son of Sieg2. It’s a small world after all. Mime thinks Siegfried can get him the One Ring. You remember, the one with the fratricidal giant Fafner? FYI: He’s now a dragon (don’t ask). Strider the “Wanderer” arrives and poses a few riddles, Siegfried drinks blood and learns to speak bird (again, don’t ask), and Mime gets what’s coming to him. A broken sword is forged anew, a spear is shattered, and Siegfried awakens a sleeping Brünnhilde with a kiss. Also, there’s a bear. At first, Siegfried mistakes Brünnhilde for a man and, when he removes her armor, cries ‘That is no man!’ My god, Tolkien, you are shameless. Iréne Theorin as Brünnhilde in Götterdämmerung. Photo by Cory Weaver. Norns of Exposition™ provide a “previously on” and serious foreshadowing. Siegfried puts a ring on it, but eventually bails, heading straight into the hands of those plotting against him, including Hagen, Alberich’s son. Very, very long story short, Siegfried is mindwiped and gets the One Ring back, earning Brünnhilde’s wrath. Meanwhile, Wotan moans about losing his spear (not a euphemism) and prepares for the worst. Tricksy Hagen kills twice over to get the ring but a ghostly Siegfried says “Nein!” Brünnhilde takes one for the team, riding the ring straight into the fires of Mount Doom. Fire and flood cleanse all. 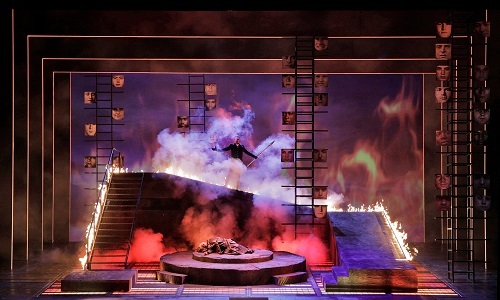 San Francisco Opera’s Der Ring des Nibelungen. Photo by Cory Weaver. Tune in next time for the unknown, but not unsung, at least when it comes to the movies. I promise it won’t take me three years. *I’d like to give a special shout out to the woman who couldn’t use her own set of tickets to the San Francisco Opera’s most recent production of The Ring as well as @revgirrl who got them for me. I didn’t always agree with the staging or production choices, but the singing was fantastic across the board. Bravo! **If you are thinking of commenting that this should be “fewer” instead, please read this first. Michael Desnoyers as Marco and Samuel Rabinowitz as Giuseppe in Gilbert & Sullivan’s The Gondoliers. Photo by David Allen. It also helped that the Gilbert & Sullivan operetta I was seeing was The Gondoliers, which is swiftly becoming one of my favorites. For this isn’t the first time I have seen the Lamplighters perform this piece, I also saw their 2012 production and you can see my summary of the topsy-turvy plot here. While the cast for that production was fantastic, I think this one was even better. Familiar faces included Amy Foote and Charles Martin, who returned in their respective roles of Gianetta and the Grand Inquisitor. Michael Desnoyers was also a returning player from the 2012 cast, although this time as Marco, one of the gondoliers in question, rather than Luiz, the Duke of Plaza-Toro’s attendant. Speaking of the Duke of Plaza-Toro, that role was filled by long-time favorite F. Lawrence Ewing, who I have seen previously in H.M.S. Pinafore, The Mikado, and twice in The Yeoman of the Guard. Patricia Westley, last seen as Elsie Maynard in Yeomen, played the Duke’s daughter, Casilda. I don’t remember this character making very much of an impression on me last time, but Westley really shone in the role, as did Cary Ann Rosko as her mother and Patrick Hagen as Luiz, her secret beau. Samuel Rabinowitz, who played Giuseppe, is not someone I’ve seen before, but he was a great match for his “brother from another mother” Marco. Finally, I was rather impressed with two newcomers to the Lamplighters stage: Whitney Steele, who played Tessa, and Dian S. Meechai, who played Giulia. I look forward to seeing them again. F. Lawrence Ewing and Cary Ann Rosko as the Duke and Duchess of Plaza Toro (left) and Patricia Westley as Casilda (right). Photo by David Allen. And really, I think that is the great lesson from this production. I need to make more of an effort to get out and see the Lamplighters and maybe even subscribe again to the next season or two. Note: The Gondoliers is the Lamplighters’ second production of the 2017–2018 season. They will close out the season with a singalong Iolanthe in March. *You may remember that the last (and first!) time I heard Capuçon play I did not love the piece selected. This time around, he was part of an all-around excellent program including Debussy’s Petite Suite, Haydn’s Cello Concerto No. 1 in C Major, and Stravinsky’s The Firebird.